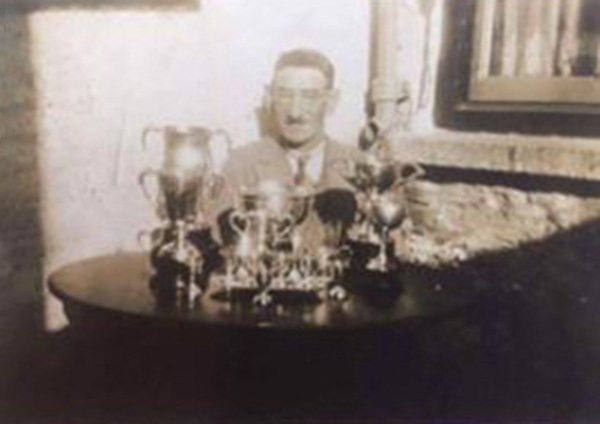 Robert Mitchell was born at Tamlaght, County Tyrone, and was a son of James and Lizzie Mitchell who later moved to live at Greenfield Street, Govan, Glasgow. Robert enlisted at Randalstown with the Royal Inniskilling Fusiliers and had attained the rank of Corporal. He survived the Battle of Messines and was killed in action on the eve of the Third Battle of Ypres, on 6th August 1917. Robert Thomas Mitchell was a son of James and Lizzie Mitchell. James Mitchell married Eliza McCord on 24th February 1891 in the district of Cookstown. 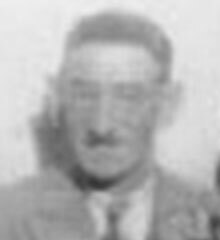 Robert Mitchell was born at Tamlaght, Coagh, County Tyrone on 9th May 1895. He was the second of six children. The 1901 census lists Robert Thomas as age 6, living with the family at house 23 in Urbal, Coagh. His father was a carter and his mother was a house maid. Family: James Mitchell, Lizzie Mitchell, William James Mitchell (born 2nd July 1893, Belfast), Robert Thomas Mitchell (born 9th May 1895), John Mitchell (born 6th September 1897), George Mitchell (born 19th March 1900), Eliza Mitchell (born 4th October 1905), James Mitchell (born 7th August 1909). The 1911 census lists Robert Thomas as age 15, living with the family at house 22 in Great George's Street, Coagh. Robert was still at school. His father was a carpenter. At some stage after that the family moved to Scotland. Robert enlisted at Randalstown with the Royal Inniskilling Fusiliers. He was living in Glasgow at that time. Robert Mitchell attained the rank of Corporal. Corporal Robert Mitchell survived the Battle of Messines but was killed on the eve of the Third Battle of Ypres, on 6th August 1917. The weather was extremely wet and this part of Belgium is low lying and the drains had been destroyed by the constant shelling. For the next three weeks soldiers would struggle through this morass with wounded men often drowning. Corporal Robert Mitchell was serving with the 9th Battalion of the Royal Inniskilling Fusiliers when he was killed in action on 6th August 1917 in this dreadful environment. Corporal R T Mitchell, Trench Mortar Battery, late of Coagh, killed in action on the 15th August. 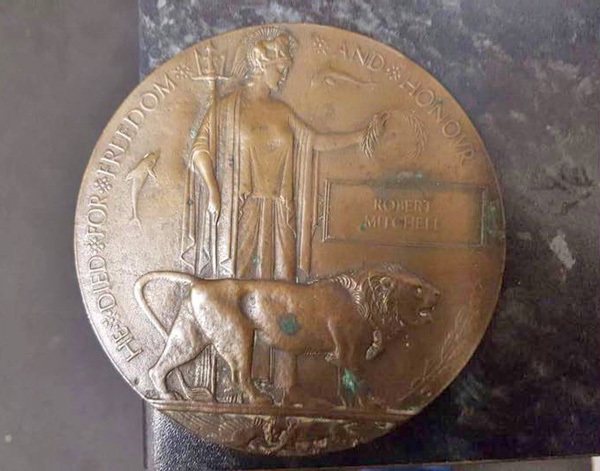 MITCHELL – Killed in action in France, 16th August 1917, Corporal Robert T Mitchell, Trench Mortar Battery Infantry Brigade, son of Mr James Mitchell, Greenfield Street, Govan and formerly of Coagh, County Tyrone, aged 22 years. But they hope to meet in a better land. You fell amidst shot and shell. To take a last farewell. Ever remembered by his sorrowing uncle Thomas and aunt Hannah, Coagh, County Tyrone. MITCHELL - Killed in action in France, 15th August 1917, Corporal Robert T Mitchell, Trench Mortar Battery Infantry Brigade, son of Mr James Mitchell, Greenfield Street, Govan. Cut off in the midst of his bloom? Though he lives in a far silent tomb. And joined the khaki throng. To his King and country loyal. Deeply regretted by his uncle John and his aunt Nancy Mitchell and loving cousins (three of which on active service), Coagh, County Tyrone. There is no known grave and Robert is commemorated on panel 22 on the Menin Gate Memorial, Ypres, Belgium. He is commemorated on Coagh War Memorial. The CWGC record Corporal Robert Mitchell as the son of James and Lizzie Mitchell, of 72 Greenfield Street, Govan, Glasgow.